The Million Dollar Prize will be split between Professor Salim S. Abdool Karim, Director of the Centre for the AIDS Program of Research (CAPRISA) who will recieve half and Professor Sheila K. West Vice Chair for Research Wilmer Eye Institute at Johns Hopkins University School of Medicine and the Rakai Health Sciences Program, based in Rakai, Uganda sharing equally the other half million dollars. 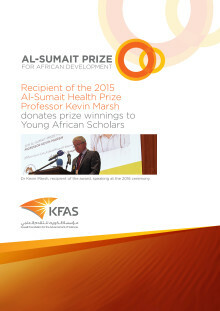 Professor Marsh of Oxford University and the African Academy of Sciences was awarded the inaugural Al-Sumait Health Prize almost a year ago. This article follows up with Professor Marsh and asks what the impact of winning the prize has been to him and his work and the roll the Prize will play in the future of African development.